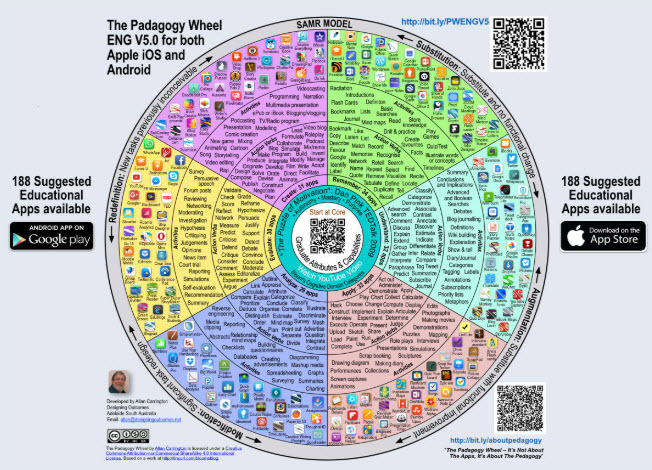 The Padagogy Wheel was designed to help educators consider how mobile apps can be used by their students. It also guides instructors to a cluster of possible tools that align with instructional requirements. The Padagogy Wheel encourages instructors to begin with a course outcome, ask themselves questions based on that outcome, and arrive at app options for their consideration. In your course documentation, identify which outcome you are undertaking. 2. Match outcome with one of Bloom’s Revised Digital Technology Cognitive Domains. Andrew Churches’ Bloom’s Updated-Digital Technology Taxonomy includes new learning opportunities offered by emerging technologies. trying to understand meaning of information? applying the information construct or demonstration? analyzing information to deduce conclusions? evaluating information to consider an issue? creating with information to publish a project? 3. Choose one or two terms from the Action Verbs sector that matches the Bloom’s cognitive domain term. 4. Select an activity type from the Activity sector. 5. Consider the apps in the corresponding sector. Then choose one to generate a learning opportunity for your lesson. After creating the activity and implementing it with your class, take time to reflect on the learning event. If it was a success, make alterations to the activity based on your observation notes that you made during and immediately after the lesson. Consider sharing this activity with your instructional peers to elicit their feedback. Since your students are already familiar with the app, it may be used in different course units or in different ways moving forward through the school year. Last year, I used Kahoot as a means of reinforcing course vocabulary and nudging more vocabulary on a unit-by-unit basis. I followed these Padagogy steps towards identifying and creating a lesson for the students. Identified the course outcome, use / practice vocabulary and vocabulary building strategies in listening, speaking, reading, and writing contexts. The Bloom’s outcome was identified as create, as I was hoping to ensure students generated a product that enhanced their use of new vocabulary. Actions verbs collaborate and construct were chosen. As students would work in pairs and the ultimate goal was to create a product using unit vocabulary. To incorporate fun and challenge, new game was chosen in the activities sector. After considering a few apps, I decided to use Kahoot as the tool to create a digital game. This activity could easily be accessed and played by classmates; it redefined their learning as they collaboratively created an original activity that was accessible globally. I hope the Padagogy Wheel is useful for those who are working towards blending technology into their instruction. It provides teachers with a system rather than randomly selecting an app. Thanks to Allan Carrington for designing this useful model. If you use it in planning an activity, share your experience below.